113 customers have given this product a 5-star rating. I thought the day that one of my guitars would not have earnie ball strings on it would never come but I was wrong! 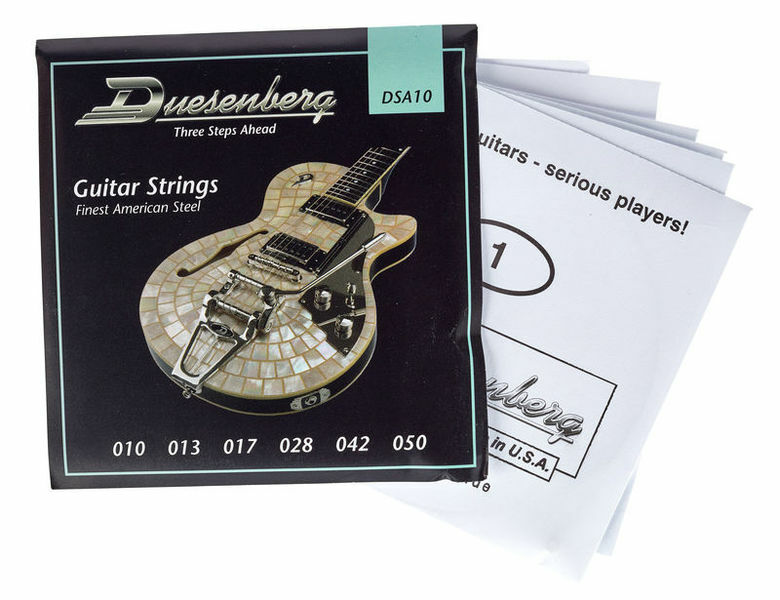 I went a bit crazy with duesenberg last summer, so along with my duesenberg guitar, strap, cleaner, and everything else, i bought these strings too. They last as long as the earnie balls, hold their tuning, and they don't snap easily. I actually dug really hard in them and pulled some crazy bends but none of them snapped so far! The slightly heavier bottom feels very nice too :) BUY THEM. They are cheap too and if you buy 6 of them you get better price! If you have a Duesenberg get these. Not easily obtained in the UK but are the perfect match for my Starplayer TV Mike Campbell. Great sound and long life with different spread of gauges from the usual manufacturers. ID: 240536 © 1996–2019 Thomann GmbH Thomann loves you, because you rock!